Happy publication day to Lilly Bartlett, here is my review for this festive novella which will keep you warm and snuggly over Christmas. 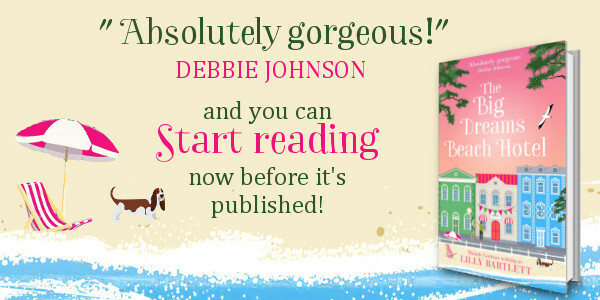 When Lottie receives a call to say her Aunt has been in a terrible accident and is in the hospital it feels like deja vu, she lost her parents in a similar accident and the terror she feels that it could be happening again grips her. Rushing to Wales with her daughter she finds her Aunt in a medically induced coma, now she must look after the Guesthouse which has a reviewer coming for Christmas. Lottie is a programmer and has never looked after a Guesthouse a day in her life, more to the point she has never even seen her Aunt’s Guesthouse and setting eyes on the property does her confidence no good as it’s a falling down building that should probably be condemned rather than accept guests. In a moment of panic, she convinces the taxi driver Danny to help her. Over the next few days, Lottie and Danny fumble their way through the task of trying to impress the reviewer and his family while they get to know each other. And well, it’s a romantic Christmas story so you know…things happen that shouldn’t, funny things happen, and then the two main characters maybe figure out a way to like each other more than they did in the beginning. Lottie is a great character, she gets herself into some really laughable situations. Danny is a great character although I would have liked to see a bit more of him and the development of his character, although I appreciate in a novella there is only so much page space. The guests are a nightmare and add a fabulous flavour to the whole experience causing mayhem and mischief to what Lottie is trying to create as a wonderful Christmas experience for them. This was a quick-read, funny, and gave me the warm and fuzzy’s. Definitely, one for you to put by for your Christmas reading. Huge thanks to Lilly Bartlett and Notting HIll Press for the eARC so that I could read and honestly review this novel. After having her heart broken by a guy named Chuck in New York, Rosie rushed back home, giving up on her career working in top flight hotels and started working in a small run down hotel in the seaside town she grew up in. When three years later the hotel is sold and Rory is brought in to manage the transition she realises she may have to learn to trust and love again because Rory is determined to break down her walls. Lilly Bartlett has created a beautiful story here, we get to see in flashback chapters exactly what happened with Chuck, how he created the perfect relationship and ripped it all away. Why her trust is no longer won easily and why she can only see the worst in Rory. Rory does everything he possibly can to show her he is honest and kind but she cannot see it. She looks at each situation and see’s betrayal and deceit. His job doesn’t help and other circumstances which happen making things look worse than they are. There are a wonderful cast of characters in this book, there are such a lot of laugh out loud moments from these flamboyant characters who keep the mood up. It leaves you in no doubt why Rosie has continued working at the hotel for so long with such hilarious permanent residents to keep her entertained. This is definitely a book you will want to go back to again and again, it’s a perfect pick me up and will keep your shelf happily warm. A huge thanks to Lilly Bartlett and Harper Impulse for the eARC so that I could read and honestly review this wonderful novel.